I have always disliked the term “housewife.” Blame it on my background, but it has always sounded a bit like a plantation term. Or it sounds like a woman who is “kept,” bought and paid for, with nothing to do but stay home and stuff her face full of delicacies. I prefer “homemaker.” I do, in many ways, make my home. However, I’m not solely responsible for my house being a home, either. I still have not gotten used to telling strangers and people I am meeting for the first time what it is I do when they ask. Sure, if I’m meeting another Christian, I know it is usually safe to say “I stay home with my kids.” But other people raise an eyebrow, scan me up and down, and then say, “Oh…” as if they are disappointed in my career choice. That’s why I’ve decided to come to the defense of housewives and homemakers everywhere…someone has to, why not me? Whenever I have a man tell me that I have the hardest job on earth, I smile and feel a wave of satisfaction sweep over me. I DO have the hardest job. Every mom who stays home with her kids, day in and day out, has a difficult task before them. Why? Well, besides the fact that children can make you daily want to give them back, you are also managing a home complete with cooking, cleaning, shopping, maintaining. Kids, unlike fellow employees or direct reports, don’t go sharing the workload (when they are little), or let you vent to them about your boss. They think they are the boss, another daily struggle each mom must fight…and win. I made a choice. I consciously chose to stay home. I chose my children over myself. I chose my home over my own wants and needs. More than that, I am proud of my choice. Sure, some days I dream of a corner office, a secretary, and an hour long lunch break, but I’m still content and thankful each and every day that I am able to stay home with my rug-rats. Being a stay at home mom is not the result of a series of screw-ups and accidents, but a decision to be exactly where I am…exactly where God wants me. Yet, if someone had told me 6 to 7 years ago that I would be pregnant with a third child and a stay at home mom, I would have laughed in their face and asked where the secret camera was hiding. Come out, come out, wherever you are, Ashton. I wanted nothing–and I mean nothing–to do with staying home. Now, however, whenever I meet another mom who has forgone an exciting career, allowed her college degree to collect dust, traded scrubs for sweats, sacrificed money for “Mommy,” I feel a twinge of pride and hope. I know that each and every mom who has given up herself and her dreams to fulfill new and even more exciting dreams has paid the price. Dedication to one’s family is not free. So, in defense of housewives everywhere, I say to all the eye-rollers and doubters, all of those people who seem sad for me, as if I’ve made some massive mistake: You’re wrong, I’m proud of my choice… and that’s all there is to it. What choices in life have you ever felt the need to defend, when others have judged or disagreed with your choice? If doubt ever creeps into your decisions, how do you handle it? Too funny! And so true! I know, why do women feel they need to come to the defense of only one side of the issue? I have friends who are working moms. They have made that choice alongside their husbands and through prayer. Who am I to judge their decision? I made a choice for my family. It just happened to be that I stay home. I have to say though, I have definitely looked around and said “Why am I doing this?” as poop has exploded or juice has spilled for the 13th time. 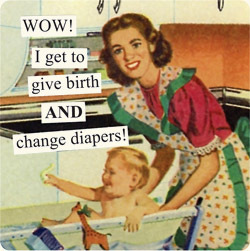 Ahh…it’s just part of motherhood. I don’t really need to say this out loud, but I am very happy for you that you are a SAHM. Great post! As the daughter of a (very intelligent, highly educated) woman who stayed home for at least 6 years, I respect every woman who makes this choice. I know how much it made my childhood great and I wouldn’t under-estimate that experience. I’ve been around other women my age (unmarried, not moms yet) who seem to think that our mothers weren’t fulfilled because they stayed home and that makes me so sad. Each woman deserves to choose for herself and not feel judged for that choice. If nothing else, I’m so grateful for the choice that some of us have to opportunity to make. I know that I will be doing some serious soul searching and prayer when/if the time comes for me. I wonder how many stay home moms go about feeling unfulfilled? I bet there are more than we think. It is a hard and thankless job, with no perks and no promotions. The women I know though, who love God and stay home, have seen God bring real fulfillment. I have this blog, for instance. It is my “non-mom” life and I am grateful for it. You are so right that each woman (and family) must decide for themselves, hopefully without fear of judgment or ridicule from others. Great post, Nicole! Even when I was a liberal feminist I didn’t understand what all the hoopla was about when it came to SAHMs. If women really want to be “equal” than they should be commended for any choice they make, but today it’s like if you choose to stay home you are crapping all over the women’s lib movement. At the same time if you choose to work and stay single other women will say you are ignoring your biological calling. Women can be so mean to each other. The more I’ve studied God’s Word, the more I actually wonder if the women’s lib movement destroyed the family and the economy. This is coming from a woman who used to be a self proclaimed feminist. But video games and day care have taken over the roles of parenting and nurturing and children are learning very few life lessons. It is now very difficult for families to survive on one income (with God all things are possible)so most moms feel forced to work. I wonder if we’ve taken it all too far. We got the vote, then we wanted to call to be head of the household too. On that same note, I’m a woman who is considering going back to school for a professional degree (MD) and having children. But I know that the time will come when I might have to give up what I want for what the Lord is calling me to. I’m open to that, but honestly, it makes me a little nervous. You are so right on! I think the woman’s lib movement is very much to blame for women turning on one another for their personal decisions. The problem, which I have written about before, is that women have been fed the lie that they can “have it all..right now.” It simply is not true. I cannot have a career and the fulfillment of being home with my children at the same time. I had to choose. Right now, I chose my children. In 12-15 years, I might be able to have more of a career. Women have to surrender to the place God is calling them, not compare themselves to every other woman. At any rate, you raise to many great points in your comment. It is worthy of a whole separate post. The decision to marry my wife after only a few weeks of dating is one that I had to defend to my family. When we told my parents, my mom said, “I hope it will last.” So far, almost 12 years later, it has. Wow, after only a few weeks? I’m impressed and I always love stories like that. My husband and I were engaged after 6 weeks and we were met with a fair amount of resistance from family and friends. Congratulations on choosing wisely and to 12 years of marriage. My belief is that long engagements are simply a ruse to plan the perfect wedding. Marriage is covenant, not ceremony. Marriage is covenant, not pomp. I am all for two people in Christ simply looking at one another, realizing they want to walk covenantally together, and then striking that covenant with our Father as witness and in His Name. But I’m kinda simple like that. Marriage is covenant, not convenience. My husband and I always advise and counsel people away from long engagements. The world is selling a wedding. God is offering a covenant. The two should never be confused. Thanks so much for this!! Lately I’ve begun to feel the disappointment from my parents regarding my choice to stay home. This was refreshing to read!